Home › Science & Tech › BPG: the Successor to JPEG’s Throne? The JPEG—a universal and inescapable format for digital images—might be becoming obsolete soon. Computer programmer Fabrice Bellard recently created the file formal BPG (short for Better Portable Graphics) in an attempt to replace the ancient file type, and the results are promising. BPG runs off of HEVC (High Efficiency Video Encoding), an algorithm recently developed that itself has great amounts of potential for compressing files. Essentially, through using a modified version of this algorithm, BPG files provide a clarity equivalent to a JPEG image up to four times the size. The implications of storing images at a quarter of the normal size without sacrificing quality are tremendous, and as such, BPG is a theoretically revolutionary technology. 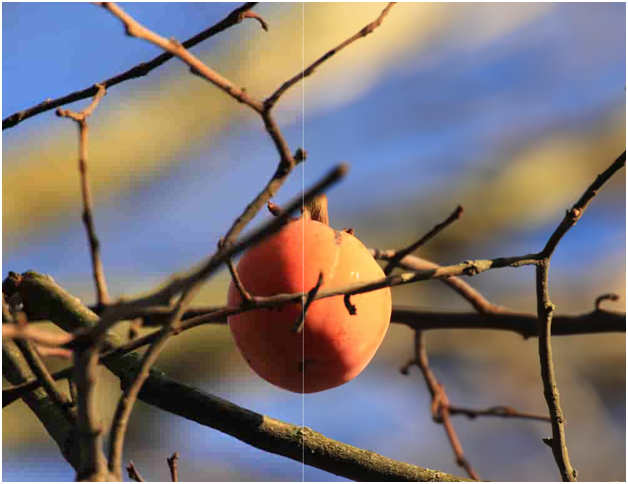 This image of a peach serves to illustrate the great divide in quality between JPEG and BPG. The side of this image to the left of the white line is compressed as a JPEG, and to the right as a BPG, at similar file sizes—both the JPEG and BPG are within .1 MB of each other. The difference in quality is astounding—the JPEG is pixelated and has an obvious lack of quality in color (this is especially visible around the branch in the background, where there is apparent pink distortion and pixilation). The BPG has a preservation of the photo’s original quality that is unmatched by a JPEG much larger than the one pictured here, an astounding feat of compression. The implications that this has are enormous for numerous reasons. Websites hosting images could cut down the file size to a fraction of what they would otherwise be without sacrificing clarity, a number which adds up. Digital cameras using the algorithm could provide higher-quality images free from the outdated JPEG format. Even further, BPG could double or triple the amount of photos that could be held on a camera or phone. BPG is unlike most new technologies in that it is not held back by an issue of technical feasibility so much as legal use. HEVC, which is utilized heavily in the compression of BPG files, is patented—meaning that if BPG were used for commercial purposes, it might cause legal troubles, or at least high fees for those trying to use it. To see just how huge these feed might be, we can look back again to JPEG, which was patented after a 16-year filing process in 2002. Forgent Networks, the company which held the patent on JPEG, made up to $105 million in a stretch of about two years—an amount that the patent holders to HEVC might be getting if their technology, through BPG or otherwise, becomes the new standard for images. However, HEVC is increasingly being licensed for use in products, so the future is not so dubious—HEVC will be supported in Windows 10, and is already used for compression when using Facetime on the iPhone 6 and 6 Plus. Perhaps another factor preventing the spread of lossless formats like BPG into common use is the standardization of JPEG as a file format. Most people don’t honestly care about optimizing quality and file size, so it’s unlikely that they would make any change they don’t have to—after all, most people won’t notice much of a difference in quality between a BPG and a JPEG unless they are looking for it, and the licensing cost only serves to incentivize people to keep the JPEG format. Unless people outside of the tech world start caring immensely about photo quality, it’s dubious how quickly these formats will be introduced into common use.